This fascinating look at artist Thomas Cole's life takes readers from his humble beginnings to his development of a new painting style that became America's first formal art movement: the Hudson River school of painting. Thomas Cole was always looking for something new to draw. Born in England during the Industrial Revolution, he was fascinated by tales of the American countryside, and was ecstatic to move there in 1818. The life of an artist was difficult at first, however Thomas kept his dream alive by drawing constantly and seeking out other artists. But everything changed for him when he was given a ticket for a boat trip up the Hudson River to see the wilderness of the Catskill Mountains. The haunting beauty of the landscape sparked his imagination and would inspire him for the rest of his life. The majestic paintings that followed struck a chord with the public and drew other artists to follow in his footsteps, in the first art movement born in America. His landscape paintings also started a conversation on how to protect the country's wild beauty. Hudson Talbott takes readers on a unique journey as he depicts the immigrant artist falling in love with--and fighting to preserve--his new country. 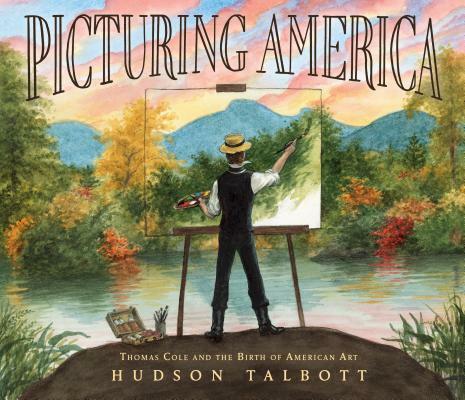 Hudson Talbott has written and illustrated more than 20 children’s books, including Newbery Honor winner Show Way (by Jacqueline Woodson), ALA Notable Book and VOYA Honor Book Leonardo’s Horse (by Jean Fritz), and We're Back! A Dinosaur's Story, which was adapted into an animated film by Steven Spielberg. He lives in the Hudson Valley of New York and in New York City.